Plan vacation or business trip with eTravel.com and take advantage of cheap rates on flights booking, airline tickets, and lowest airfares for Dubai. Search cheap flights to Dubai, find and book single or multi-city destination flights. On this page we give you information and glimpse of visiting places in Dubai, Dubai, United Arab Emirates. Dubai is one of the seven emirates, and the most populous city of United Arab Emirates (UAE). Sitting on the southeast coast of Persian Gulf, Dubai has emerged as a business hub and a global city of the Middle East. Home to world’s tallest building, exquisite shopping, and diverse culinary landscape, Dubai is everything one should see. Dubai has hot desert climate with summers being extremely hot, humid and windy. Therefore, it is better to plan a trip to this emirate in cooler months, between November and April. The blazing sun during this time is resting and the skies are blue, and the breeze makes it perfect beach weather. It is also the peak tourist time, so make sure you have your flights and hotels booked beforehand. If you want to escape the crowds, you may visit during the summer months, but prepare yourself for scorching heat and high humidity. What are The Must-see Attractions in Dubai? Dubai has emerged as the world's preferred tourist destination for taking short breaks. The city offers best of futuristic entertainment wrapped beautifully in profound traditions. Towering 828m above Dubai, this mega skyscraper represents the amalgamation of art, architecture, engineering and heritage. Burj Khalifa is home to several office spaces, private residences, and a 160 room Armani Hotel. There is an observation deck on 124th floor, called At The Top, which provides stunning view of the city, specifically at night when Dubai is gleaming. The recent addition though is the observation deck at 148th floor, which is again the highest in the world. Think of retail therapy, delectable global cuisines, and world class entertainment for all ages – the answer is Dubai Mall. This largest mall in United Arab Emirates (UAE) set on the foot of Burj Khalifa is stretched across 1.1 million square meters. With more than 1200 retail outlets including clothing, accessories, electronics, books, Dubai Mall has covered it all. The Mall has fine dining restaurants, aquarium, ice skating rink, movie theatres, kids play areas, and much more. Desert Safari is one experience you cannot miss while in Dubai. An approximately five hour evening tour takes you through the scenic deserts across the Red Dunes of Al Habib to a desert camp where one can enjoy a scrumptious barbeque dinner along with traditional entertainment, such as camel ride, applying traditional henna on hands and belly dancing. In the heart of old Dubai, the Arabian markets are bustling with plush gold jewelry, traditional fragrances, hand woven fabrics and rich spices. Wander through these souks of Dubai – Gold Souk, Textile Souk, and Perfume Souk to travel back in time and treat your senses to copious sights, sounds and scents. Other must visit attractions in Dubai include Burj Al Arab - a luxury hotel, Palm Jumeirah - an artificial archipelago and Dubai Miracle Garden - the world's largest flower garden. How to Save When on a Dubai Travel? 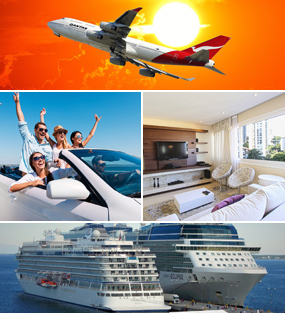 The first and foremost thing to save while traveling is to book the hotel and flight tickets in advance. A minimum 30 days is good, however, earlier the better. Check for airline discounts as most airlines operate via Dubai, it being a central hub for people and cargo alike. Lastly, use public transport, cabs and metro services.